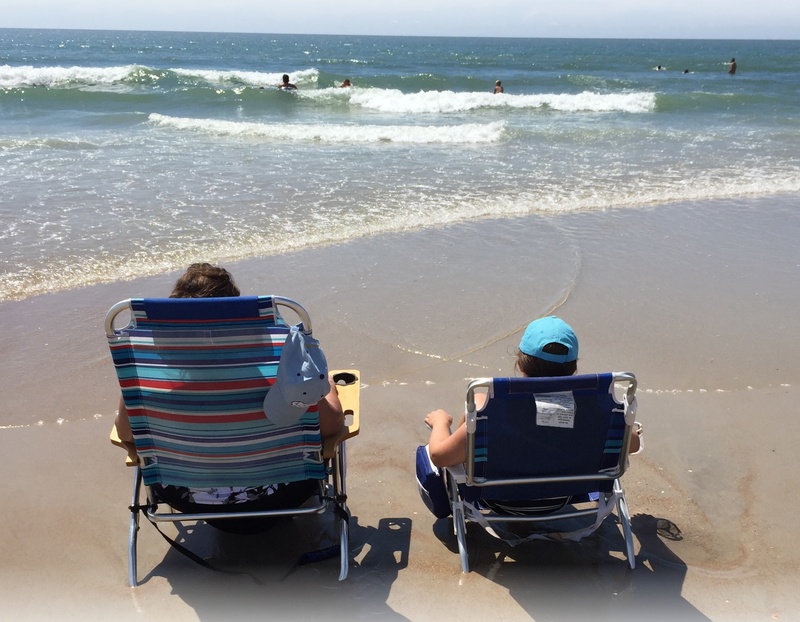 There are always “moments” that I take away from our annual beach vacation, often more than I can write about in one blog. There are more pictures on my cameras than I will ever post, and more photographic moments that I have embedded in my mind other than my camera phone or my Nikon. It is when I reflect and scan through the photos that my memories are enlightened to the simple things that sometimes tugged a little more on my Momma heartstrings. I think this may have been the first year that my daughter and I spent this much time alone just sitting in the surf. We are busy beachcombers! always looking for treasures. This year, the treasures were not always in the form of shells or sea glass, or even the endless walks on the shoreline – but a stolen moment that she and I shared together…observing the people around us. I was content to sit and leisurely talk about the day and the excitement of her having some friends to visit in the next few days. Ahhhh! summer as a teen with your girlfriends laughing, enjoying every possible moment. Time seemed to stand a little more still on this particular day for the both of us. Standing on the edge of the surf we watched a Dad and his son, maybe about the age of three, tossing his bright sand bucket into the surf and waiting for its return. The little fellow anxiously ran to the sand bucket, scooped it up and handed it back to his Dad. Every single time the bucket left the little boys hands.. he giggled and clapped his hands. It seemed to be a repetition of the same over and over.. yet, the response was always the same. giggle..laughter.. repeat. Several times the sand bucket was almost washed out of reach, but no matter – he waited patiently for the return. My daughters’ first reaction was “Aww, Momma look! He is such a happy little boy! I remembered that we had purchased a “wave runner” ball more than a couple of years ago – I carried it in my beach bag every summer where it became stationary, no one ever actually played with it anymore. I asked her to go get it from our bag and bring it down to the surf, I figured the little boy was having so much fun with that sand bucket, that he would actually enjoy the ball. The only problem with that idea? I had also asked her to take it over and ask if they would like to have it. It’s not that she didn’t want to give it to them, but that it was out of her comfort zone to approach someone she didn’t know to offer a gift – even if it was just a ball. She gained some courage and offered the ball. The Dad said thank you, but you know it’s probably going to get lost? She told him it was fine, we no longer used it and thought he would enjoy it. We watched the little boy play with the ball for a very long time. Same response.. giggles while he scooped up the ball and clapping his hands. My daughter commented how happy that little boy was just playing with his Dad. No matter how hot it was, and how exhausting the same repeated action had taken place? The one thing that never changed was the child’s excitement over that ball. We talked about the fact that the ball was just a ball, but the little boy was one of the happiest children we had seen all day. I asked her if she noticed anything “different” about him. She just chatted away about how that he was just happy and having a great time. She didn’t notice that the child had Downs Syndrome. She saw “happy”. It’s not that she wasn’t aware, she was. Happy means different for all of us. It’s in the smallest of things that bring us the biggest joys… chasing a ball in the surf, spending the time with our children – even when we are tired and exhausted. Dealing with obstacles yet focusing on the joy of a moment. Moments.. that’s all we have sometimes. The sea has a way of making me feel small in a very large world, calm in the midst of storms swirling around us. Thankful in a world full of so much ungratefulness. I whispered a prayer for the little family in the surf that day. I petitioned on their behalf for many more moments of giggles and laughter. Teachable moments by the sea…? I think for that moment, the teacher in this Momma became the student. As for my own child… I witnessed the joy of giving through her eyes.